Cardiff and Vale College Electrical Installation apprentice Tom Lewis will be joining the best of the UK’s young learners as he heads off to Budapest for the EuroSkills finals later this month. 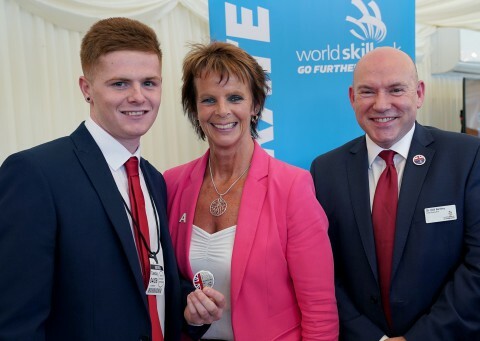 Tom and the rest of Team UK were urged to “Do your country proud” at a rousing Parliamentary reception attended by Minister of State for Apprenticeships and Skills Anne Milton MP. Team UK – 22 of the UK’s elite apprentices and students working in the engineering, digital, construction and professional industries – are facing the stiffest competition imaginable when they face the best from across the Continent. Twenty-one-year-old Tom Lewis from Maesteg has been supported throughout the WorldSkills process by his employers Blues Electrical and his CAVC Electrical Installation tutor Geoff Shaw. The Appernticeship Programme in Wales is funded by the Welsh Government with support from the European Social Fund. Members of Team UK have all spent a minimum of two years in intensive training winning regional and nation competitions, highly intensive team selection processes, and months of accelerated training – to reach international standard. Anne Milton, Minister of State for Apprenticeships and Skills, said: “You are the future, you are representing the country – and doing us proud.